In this video, we will discuss, how to get the select list options from an array in the component class, instead of having them hard-coded in the HTML. This is continuation to Part 9. So, please watch Part 9 from Angular CRUD tutorial before proceeding. Step 1 : Create the Department class. Add a TypeScript file to the models folder. Name it department.model.ts. Copy and paste the following code. Notice the Department class has 2 properties - id and name of the department. Please note : The "Department" type is not required for the application to work, but it adds great value during development. Using it provides us intellisense, error checking and type saftey. Step 4 : In create-employee.component.html file, modify the HTML that displays the "Department" dropdownlist as shown below. 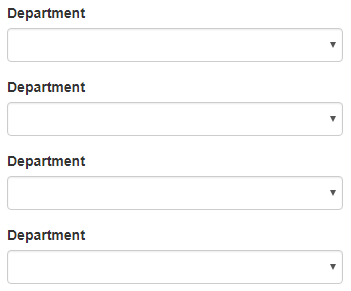 For each "Department" object in the "departments" array, we get an option. To display the deprtment name we are using interpolation. We discussed interpolation in Part 8 of Angular 2 tutorial. Since ngFor is a structural directive there is an asterisk before it. Structural directives modify the DOM, i.e they add or remove the elements from DOM. Adding and removing elements from DOM is different from showing and hiding. We will discuss all these in detail in our upcoming videos. At this point, when we select a department, the respective department id is included in the Angular generated form model. Along the same lines, when we click the "Save" button the respective department id is logged to the console. Please note : It is important that we include the ngFor directive on the element that we want to be repeated. In our case we want an option element for each department we have in the array. So we included the ngFor directive on the option element. If we instead include the ngFor directive on the "div" element that has the bootstrap "form-group" class as shown below. We get 4 department dropdownlists. That is one for each department in the array. So it is important we include the ngFor directive on the right element. "&ltselect&gt id="department" class="form-control" name="department" [(ngModel)]="department"